How Should The New President Heal Our Divided Nation? Once again, our country has gone through a peaceful transition of power as President-elect Donald Trump J. Trump was sworn in to become the 45th President of the United States. While some of his campaign rhetoric left many with a feeling of unease his legacy will be judged on his slogan to Make America Great Again. But we are living in an increasingly divided nation where it seems as if people on one side of the political spectrum don’t wish to engage with the opposite side. How will your new president bring our great nation together? 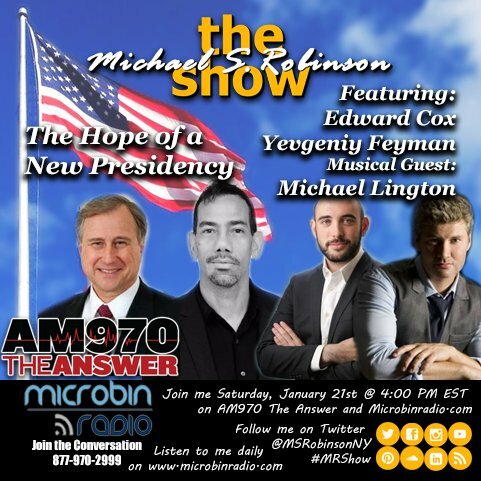 In this episode, Michael S. Robinson holds a wide ranging conversation with his guests: Edward Cox and Yevgeniy Feyman. Later own special musical guest saxophonist, producer and composer Michael Lington.